There is always a buzz when we talk about a leader and the manager. Leadership is a skill and the person who possess this ability is known as a LEADER. On the other hand, Management is a discipline, and the practitioner of this discipline is known as the MANAGER. Leader and manager have a great role to play in any organization, in the sense that a leader is the one who inspires, encourages and influence his men, to work willingly, in the attainment of the organization’s objectives. On the other hand, a manager is an important link between the firm and its stakeholders, i.e. employees, customers, suppliers, shareholders, government, society, and so forth. He is the one who performs basic managerial functions. This article excerpt might help you to understand the difference between leader and manager, take a read. Aim Growth and development. Attainment of the required result. Change Leaders promotes change. Mangers react to change. A leader is a person who influences his followers to achieve a specified goal. He is a person with a vision and inspires his followers in such a way that it becomes their vision. He helps them in making the strategy to achieve the goal and possesses a good foresightedness along with the other qualities like- motivating the subordinates, creating teams, innovation, developing trust among the stakeholders, etc. A leader is required at all levels of the organization which acts as a representative of the organization. He encourages the whole team to work together and supports them in accomplishing their tasks, as a guide or a philosopher. A manager is a person who manages the organization such that he is responsible for planning, organization, direction, coordination and control. They are the ones who get their work done by the employees through several ways and has the authority to hire or fire the employees. There are various types of managers present in an organization such as top level managers, functional managers, project manager, general manager. 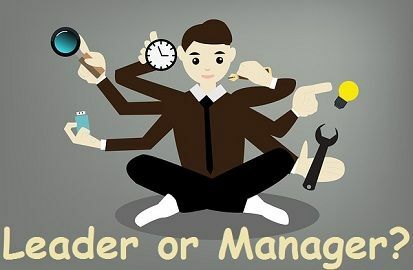 The role of these managers depends on their nature of work like top level managers are held responsible for the vision and mission of the organization, functional managers are responsible for different areas of their work like marketing, sales, accounting, etc. Project managers take the responsibility of accomplishing a certain project, and the role of a general manager is vivid i.e. the various activities performed in the business are managed by him. A leader influences his subordinate to achieve a specified goal, whereas a manager is a person who manages the entire organization. A leader possesses the quality of foresightedness while a manager has the intelligence. In an organization, it is the manager who performs the five major functions, i.e. planning, organizing, leading, controlling and coordinating. So, if we say a manager is also a leader, the statement will be correct, but not all the managers are leaders as only those managers are considered as a leader who performs the functions like leaders such as encouraging, motivating, inspiring and so on. Further, the leader can be any person who influences others, the title is not attached to a management position. On the other hand, a manager can only be a person holding a management position. After discussing a lot about the difference between a leader and a manager, we can conclude that both are necessary for the organization success. A good leader and manager can help the organization, to survive in the long run and compete with its competitors. The role of a leader is positive, wherein he figures out the hidden talent in his followers and gives them a proper guidance to achieve the goal. While the role of a manager is a little negative, wherein he criticizes its employees just to make them best in their fields, but not to demoralize them. I used this page for my studying that is very important to understand my assignment. Very important contribution to my research project. Thanks! This article will help me a lot with my final exam. Thank you so much! Very good research, it was very interested and helpful for me.